My work is inspired by my native Ireland -- a place where remnants of ancient civilizations blend with modern culture to form a unique aesthetic experience. 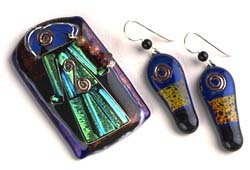 Layers of imaginatively cut glass are fused together, often incorporating copper and silver. Celtic spirals and concentric circles abound. Faces, forms, birds, animals and plants are portrayed through the union of intricate metal work and colorful glass. A wide array of earrings, necklaces, brooches and pendants are available. Each piece is a handcrafted original. To place an order or to discuss special commissions please feel free to contact me. I show my work by appointment only.